In the aggregate, American workers are doing well under Trump. There are differences between industries and age groups, but the overall trend is clearly positive. There were 62,000 more jobs in the mining and logging industry in August 2018 compared to a year earlier. With 760,000 employees, our mining companies are only 36,000 employees from their peak in 2008. Average weekly earnings are up four percent in a year and 27 percent since 2008. This industry is now bigger, in terms of jobs, than it was ten years ago: 80,000 more people work in construction now than in 2008. There has been a remarkable recovery since just last year, with 287,000 new construction jobs, to a total of 7.5 million nationwide. Average weekly earnings are up four percent over 2008 and 28 percent in the last year. With 12.8 million Americans working in manufacturing, there are 253,000 more employees in this industry today than a year ago. We are still down 653,000 manufacturing jobs over 2008, but we have gained more than 1.1 million jobs in this industry since its rock bottom in 2010. Earnings-wise, manufacturing workers are paid two percent more now than a year ago and 25 percent more than in 2008. This industry added 318,000 jobs in the last year alone, and is up 1.5 million jobs since 2008 for a total of 27,767,000 jobs in August 2018. Average weekly earnings are up three percent in a year and 23 percent in ten years. This industry is bucking the trend. Having had 2,978,000 employees in 2008 it was down to 2,645,000 in 2011, its recession low. It gained about 150,000 jobs to 2017 but is down 23,000 over the past year, which makes for a net loss of 196,000 jobs since 2008. Earnings-wise, though, information-industry workers are doing relatively well, with ten-year average weekly earnings up 35 percent and a year-over-year increase of four percent. This industry, which gauges the private sector's need for higher-end professional services, has shown strong growth since it bottomed-out in 2009. From a total of 17,856,000 employees in 2008 it lost 1.3 million jobs in one short year. Since then a slow recovery brought it to 20,679,000 last year and 21.2 million in 2018. That is a gain of more than half-a-million jobs just in one year. Average weekly earnings are also up, three percent in one year and 28 percent in ten years. This is the industry that is sometimes referred to as "tourism". That term is misleading, as it suggests that the only people using it are people traveling on holidays. This industry was notably resilient in the Great Recession, losing fewer than 400,000 of its 14 million jobs from 2008 to 2009. Since then there has been a slow but steady recovery, with more jobs already in 2012 than in 2008. Today, there are 3 million more people working in the LH industry than in 2008, and 273,000 more than last year alone. Earnings are up three percent in a year and 25 percent in ten years. A total of 93,000 new jobs in one year puts this industry at 5.9 million employees in August 2018. There are 361,000 more people working in Other Services now than ten years ago, and their average earnings are up a full 29 percent since 2008. Year-over-year earnings went up by a small two percent. Looking at the private sector as a whole, it has 127.8 million employees in August this year, up 1.9 percent over the same month last year. Average weekly hours, at 34.6, were up just a smidge from 34.4 a year earlier. The big jump was in the average hourly wage: at 2.9 percent it was the best year-over-year growth since 2015 (3.0 percent). In total, private-sector employees earned 5.5 percent more money in August this year compared to August 2017. In other words, the Trump economy remains strong, though - again - not quite as impressive as some people would suggest. It is interesting to compare his first 20 months in office to the first 20 months of Obama's second term. 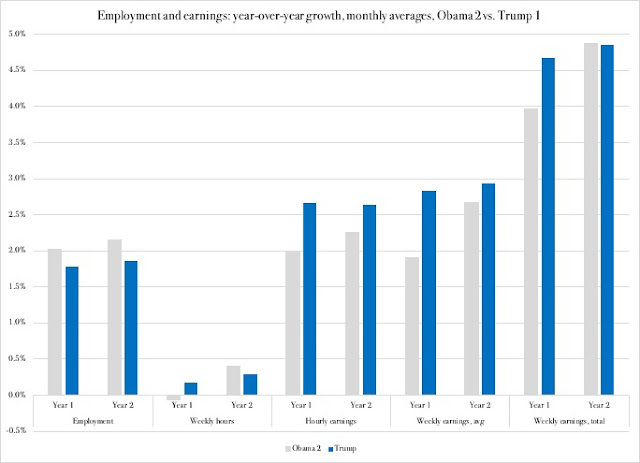 Figure 1 puts Obama's "Year 1", namely 2013, next to Trump's "Year 1", which would be 2017, and the "Years 2", in other words January through August in 2014 and 2018, respectively. The first 20 months of Obama's second term were supposed to be when the business cycle had reached its new, solid growth period after the deep Great Recession. By traditional, mainstream macroeconomic theory, 2017-18 would have been at the trough of the next recession, or at least the very end of the growth period. 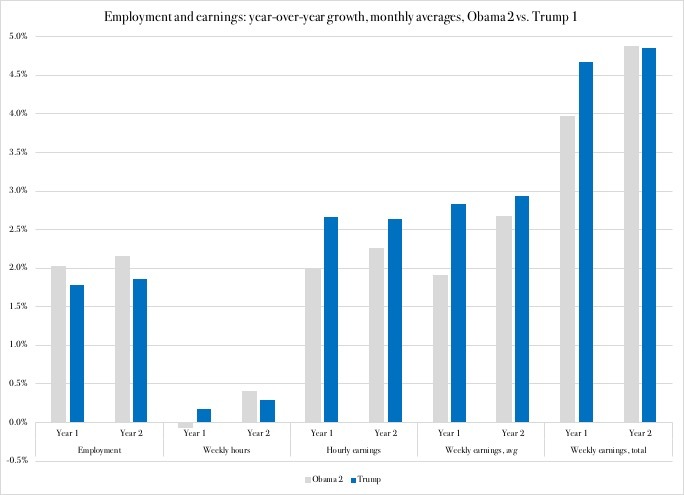 That is not what we are seeing: with the exception of employment numbers, which simply count the number of people employed in the private sector, the Trump economy is doing at least as well as, or better than, the economy did in the same period of Obama's second term. It is especially encouraging to see the strong growth in hourly earnings. This means that demand for labor is high, supply is tight and it is the worker's market. To see such strong growth this far out of a real recession (there was a blip in 2015-16) is very unusual.